habe den 240iger nun seit einem Jahr im Einsatz. bin sehr zufrieden. Hatte mir selbst etwas kaputt gefahren, sehr guter Service bei Jansen und Sie hatten sogar alle benötigten Erstazteile am Lager. Top! 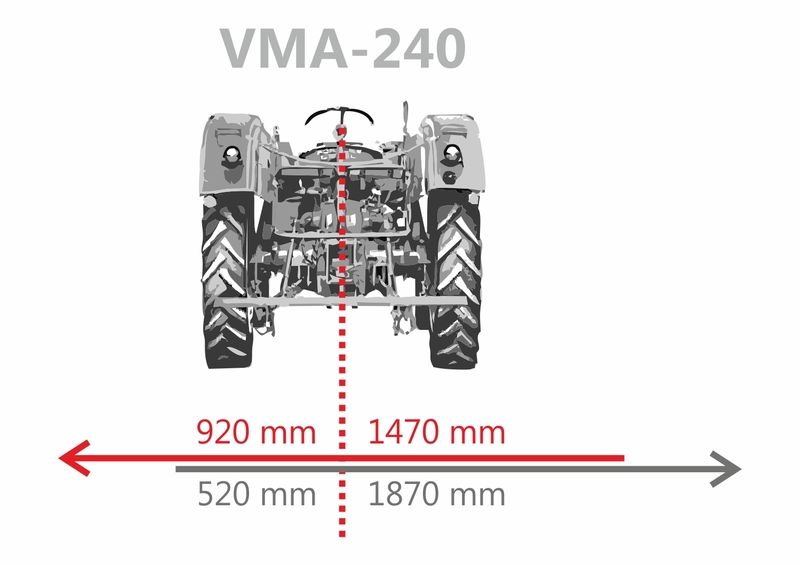 The especially robust construction of the mulch mower VMA-240 makes it stand out. It has a special reinforced angular gearbox and is outstanding in its operation. This flail mower with it´s professional quality is designed for commercial purposes. The flail mower has a mowing width of 232 cm and is driven using a P.T.O, included as part of the delivery. Due to the hydraulic lateral traverse function the mower can be moved to both left and right. For this function you need a hydraulic control circuit on your tractor, as the mower unit has a double-action hydraulic cylinder for this purpose. The cutting height can be set with the top controller and the runners mounted on the side. The VMA-240 mulching mower additionally has a trailing roller and a freewheel gearbox. The suspended chains at the front of the mower unit prevent stones escaping. Due to the open rear bonnet the mower even can be used to chop straw. Moreover it facilitates maintance work. The 22 specially hardened, 1.2 kg hammer blades, arranged on a double spiral drive shaft, shred clippings to a minimum size. Even very high grass, bushy or straw-like clippings are no problem for this mower! The mower unit is delivered in a robust wooden box. The gearbox is dry and must be filled with oil (80W90, approx. 1 litre) prior to use.